Short Review: In a fitting move, BJJ Globetrotters have released a 100% ripstop travel gi. In terms of its construction, it's comparable to the Gorilla Hitman, though not quite as light. 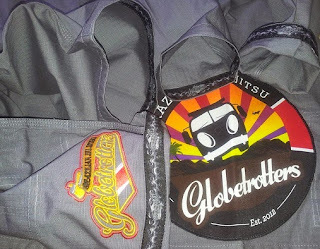 In terms of design, the Globetrotter gi is very different. There is a huge patch on the jacket, printed birds on the inside, an embroidered plane on the top of the back and stylish 'BJJ Globetrotter' emblems on the arm and trousers. The Globetrotter is also much pricier than the Gorilla: this is definitely not a budget gi. Its available to buy here, currently for the introductory price of $149 (full price is $179). Impressively, it does mention a life time guarantee and that it includes worldwide shipping, so if they stick to that, the price is at least partially justified. 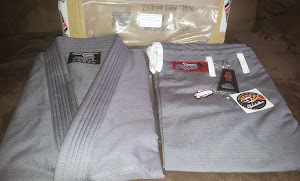 I don't think I've ever seen that much confidence before from a gi company. Full Review: 'BJJ Globetrotter' has developed into a brand over the last few years, following a trajectory which as far as I'm aware is unique. That began with a blog, written by a Danish BJJ instructor who did a lot of travelling. Christian Graugart has been blogging for around as long as I have: the earliest of his sites I'm aware of is The Viking Experience, mainly an opportunity for him to share his love of photography. After several other photoblogs detailing his BJJ travels, Graugart's blogging evolved into the much more substantial Shogun HQ. Graugart often talked about travelling on those blogs, specifically for BJJ. This all culminated in what is unquestionably his most famous blog, BJJ Globetrotter, later turned into a book (a free ebook version is apparently included when you buy this gi). It was an expansion of the BJJ travelling he'd done before, but this time on a far bigger scale, essentially 'matsurfing' around the world. This got a lot of attention, which Graugart was able to eventually direct into another extension of his original travel blogging: a new BJJ team. Or rather, sort of a team: Graugart gave an illuminating interview on that topic in a recent BJJ Brick podcast (after you skip past the long intro by the hosts). A more accurate term, from what I've seen of it so far, would be a BJJ community rather than team. The links back to those early blogs can be seen in the Globetrotter team/community's focus on meeting up and training, with an inclusive and laid-back ethos. It's one that appeals to me, hence why I signed up my own club (you can sign up as an individual too), Artemis BJJ. Unlike every other affiliation, becoming a member of BJJ Globetrotters appears to involve almost zero obligation (beyond being welcoming to visitors). The team runs regular camps, increasingly diverse and well attended. A number of the people who have attended my GrappleThons are frequent campers, like Chris Paines from Fighting Fit, as well as Jodie Bear. There are various other people I've met through BJJ who pop down too, like Braulio's first black belt, Chiu Kwong Man (who since I trained with him has founded an independent club, Team Renegade BJJ). I'll be going to the Belgium camp in August, as that gives me a good excuse to finally return to the land of my birth (and the land of many, many excellent art galleries ;D). Given that travelling is such a big part of the team identity, releasing an official team gi in super light ripstop makes perfect sense. There's a massive patch on the front of the jacket, something normally found centrally on the back. Either way, speaking from first hand experience it is easy enough to remove, which also reduces the weight slightly. Removal leaves behind a number of needle sized holes, but after a month of rolling and multiple washes, I haven't noticed that cause any problems. For a truly super-light gi, adding large patches is arguably counter-productive due to the additional weight, but on the other hand it adds to the funky design vibe Graugart and now his team have built up over the years (I can remember some impressive patches in his repertoire, cut out from t-shirts). I've got increasingly into that mode myself, after eight years of only wearing plain white gis with no patches: as you can see from my gi wardrobe, things have changed. So, whereas I previously would have said the Globetrotter travel gi is far too bling for me, now I like those touches (apart from the large patch). In terms of colour scheme, the travel gi I was sent is in grey. There's a contrasting orange, yellow and red in the logos and patches, as well as white int he drawstring, side vents and belt loops. Presumably inspired by the blinged out Kauai gi he wore on his famous trip, Graugart has added a multitude of little details to the Globetrotters travel gi. Even before you get to the gi, there is BJJ Globetrotters merchandise in the packet, like a keyring, bottle opener and stickers. 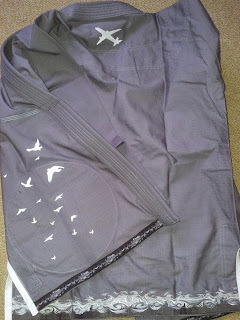 On the gi itself, there is a stylised plane embroidered on the upper back. Perhaps the most attractive feature is a fancy wave pattern flowing along the rear hem, picked up in the design on the cuff and hem tape (importantly, this isn't abrasive, as can be the case with some other gis). Another cool touch is a printed flock of birds on the inner jacket. The BJJ Globetrotters logo appears in several places, with a nifty patch on the upper trousers plus embroidered versions on the arms and lower on the trousers. Needless to say, this gi would make an IBJJF gi checker's brain explode, but then it's intended for travel, not the formal atmosphere of IBJJF competitions. In terms of weight, according to my weighing scales the Gorilla (which is an A2 Gorilla, so the A1 is presumably even lighter) is still the champion of travel gis at a mere 900g, not including a belt. The A1 BJJ Globetrotter is 1.2kg, the same weight as my other travel gis, which are an A1 adidas Response and a size 3 Gimono in BJJ cut, which is roughly equivalent to an A1. Unlike the Response and Gimono, the Globetrotter has armpit reinforcements, adding slightly to the weight, but then the Gorilla has them too. 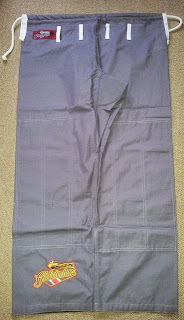 There is also reinforcement on the side vents, along with the standard extra fabric from the knees down to the shin. You might think that the printed birds on the inside would fade after multiple washes, but so far they are holding up (though that's only after a month of washing). If you've been on my Instagram recently, you may have noticed my Globetrotter travel gi is no longer grey. I wanted a more interesting colour, so turned it an International Women's Day shade of purple (incidentally, you can still donate to the International Women's Day GrappleThon, supporting the wonderful charity Equality Now). To achieve that, I started by putting the gi in a 60 degree celsius cycle on my washing machine with a pack of Dylon pre-dye to remove its current colour. That results in a sort of khaki shade, which I could then dye purple. The Dylon Intense Violet dye in another 40 celsius cycle did the trick. 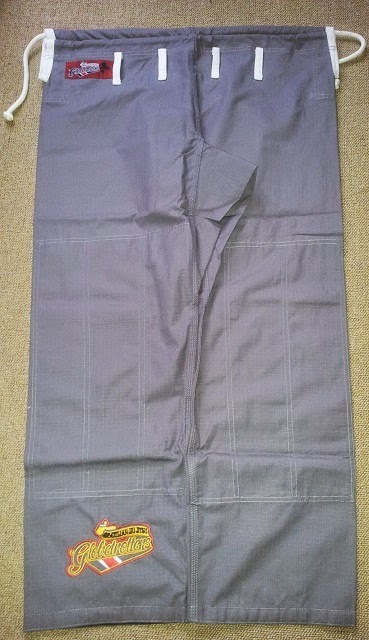 Of course, that much heat did shrink the gi a bit, but fortunately (for my tastes) it started off a little baggy. Originally, the wingspan was 156cm, the shoulder to hem length was 75.5cm and the trousers were a lanky 97cm. That shrinks down a bit after the recommended 30 degree celsius washes, but if you prefer a tight fit like me, it's worth considering a hotter wash. After a month of washing at 30 and 40 degrees, followed by the aforementioned 60 degree wash, the measurements are now 75cm shoulder to hem, 150cm cuff to cuff and a trouser length of 92cm. The gi is available to buy here, currently for the introductory price of $149. That will rise to a hefty $179, almost double what I paid for my Gorilla Hitman (though it incudes worldwide shipping and a lifetime guarantee). However, it is still less than the $190 a Kauai will set you back. If I'm right in thinking that Graugart took some inspiration for this gi from the Kauai, then selling for a similar price is understandable, if still expensive.